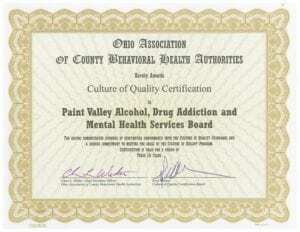 The Paint Valley Alcohol, Drug Addiction and Mental Health Board has been awarded a three year Culture of Quality (COQ) Certification. The Paint Valley ADAMH Board is to be commended for their level of visibility throughout the five-county community-system in which they serve. It was noted by the surveyors and during the certification, that all ADAMH Board staff were dedicated, transparent and knowledgeable. The Board has outlined a very detailed 3-year Communication Plan, aligned with a goal within their Strategic Plan. Prevention activities, along with the work that they are doing in the schools and the community with PAX Training and Mental Health First Aid Trainings, are effective ways of working upstream to reduce and prevent mental health and substance abuse conditions. The Culture of Quality transforms Ohio’s behavioral health system by promoting a more efficient, effective, consistent and accountable county Board system.